This is the first post of an occasional new series which I’ll be giving the snappy title Interesting Things I Found Out While Researching The Last Quiz, or ITIFOWRTLQ for short. Although it’s a bit of a misnomer in this case, because this one is more of an interesting thing I was reminded of while researching the last quiz. Photo by J Zapell – http://www.fs.usda.gov/photogallery/fishlake/home/gallery/?cid=3823&position=Promo, Public Domain. …is actually a single organism. Those tree trunks you see in the photo above aren’t in fact tree trunks: they’re stems, all linked to the same set of underground roots. The plant sends up new stems as it grows, and many quaking aspen cover huge areas: Pando covers 106 acres, or roughly 0.43 square kilometres. For readers who are familiar with Buenos Aires (this is the Buenos Aires Pub Quiz site, after all! ), that’s just over one third of the area of San Telmo. Sure, it sounds like a tiny forest. But it’s bloody big for a single plant! 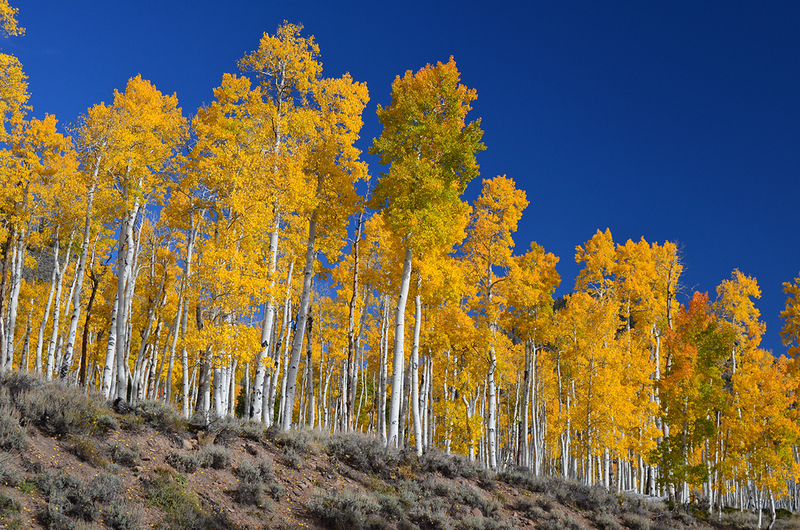 So big in fact that Pando is thought to be the world’s heaviest single living organism, with an estimated weight of around 6,000 tonnes (or 6,600 tons if you prefer American units). Numbers like that can sometimes be difficult to get one’s head around, so let’s just say Pando is really, really big. It’s also really, really, really, really, really old. The question in last month’s pub quiz which reminded me of Pando was question six of round three: ‘The oldest known individual tree in the world is an example, located in California, of which species?’ That tree is a bristlecone pine, which I first heard of as a child when I read the Roald Dahl novel Charlie and the Great Glass Elevator. The ‘individual tree’ bit of the question is crucial, since Pando is normally considered a colony of trees, in spite of technically being a whole lot of stems (it’s harder than it seems, making sure 55 questions a month are written so as to avoid ambiguities!). The oldest bristlecone pine known is 5,066 years old. Try and think about that for a moment. When Jesus Christ was born, that tree was already over 3,000 years old. Next time you’re at the BA Pub Quiz and I ask a question about an ancient Greek philosopher, consider for a moment that we are closer in time to the day on which Plato founded the Academy than Plato was to the day on which that bristlecone pine sprouted into life. And now, back to Pando. Pando is estimated to be at least 80,000 years old. Forget Jesus or Plato, that’s well over 60,000 years earlier than the first undisputed archeological evidence of human beings in the Americas. We think the Industrial Revolution was a long time ago. Pando, if he could think (it’s a male clonal colony, as far as plant sexing is concerned), and if he cared about human history, would recall it as if it was early October – because to him, it is. 160 years in the life of Pando is roughly equivalent to two months in the life of a human being who lives to the age of 80*. Pando’s age can’t be determined like a non-clonal tree’s can, by looking at tree rings, because each individual shoot (or ‘tree’ as we’d see them above ground if we were to visit it) only lives for about 130 years. It’s the root system which is thought to be 80,000 years old, and some estimates put its age at as much as one million years. I wanted to start this series with Pando (even though I’d come across him before) because nature is often a part of the BA Pub Quiz, but also because trees in particular fascinate me. They’ve lived through almost every event I could conceivably ask a pub quiz question about, and in Pando’s case a hell of a lot more before recorded history ever began. Pando is currently thought to be dying, and sections of it are fenced off to allow new shoots to grow. It currently consists of around 47,000 stems (‘trees’), all genetically identical to one another – that’s how it was first discovered to be a single living thing – but the rate at which new shoots are being sent up doesn’t match the rate at which old ones are dying. I’ll try and write one of these posts a month, always based on something I’ve either been reminded of or have found out for the first time while researching the previous quiz. That is to say, I won’t be giving away the answer to any question I’ve not already asked in these blog posts. The sources for this post in particular, apart from bits and pieces I remembered from other reading, are the Pando Wikipedia page, and this Atlas Obscura post. Oh, and apologies if this got a bit boring. That, it goes without saying, is my fault rather than the subject matter; it’s been a while since I wrote about anything other than football, which is one reason I wanted to start this series. *Unless I’ve got the maths wrong. There’s quite a good chance I’ve got the maths wrong here, so I’d welcome any corrections.